In this tutorial we will show you how to install MyWebSQL on CentOS 7. For those of you who didn’t know,MyWebSQL is a powerful web interface designed to help handle all aspects of your MySQL server through a web browser. Made to be fast, easy-to-use, and readily accessible from anywhere, MyWebSQL allows you to keep track of your databases from any location, through any device. And with support for various MySQL servers, you also don’t need to worry about it supporting the one you are currently using. If you’re looking for a web management tool, but you need something other than phpMyAdmin, then this is a solid choice to go with. This article assumes you have at least basic knowledge of Linux, know how to use the shell, and most importantly, you host your site on your own VPS. The installation is quite simple and assumes you are running in the root account, if not you may need to add ‘sudo’ to the commands to get root privileges. I will show you through the step by step installation MyWebSQL on a CentOS 7 server. Step 3. Installing MyWebSQL on CentOS 7. Congratulation’s! You have successfully installed MyWebSQL. Thanks for using this tutorial for installing MyWebSQL in CentOS 7 system. 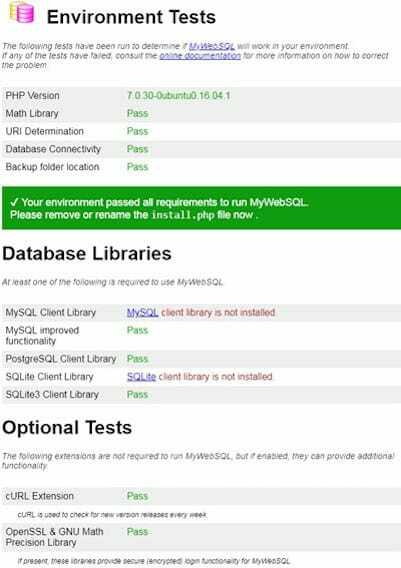 For additional help or useful information, we recommend you to check the official MyWebSQL web site. Related Posts of "How To Install MyWebSQL on CentOS 7"